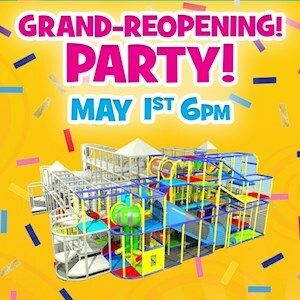 Join us May 1 for our Grand Re-Opening Party! Play on the NEW PLAY STRUCTURE ADDITION, enjoy FREE cotton candy (1 per child), and meet Chipper! PURCHASE ONLINE BY APRIL 26 FOR YOUR CHANCE TO WIN YOUR WAY INTO THE VIP PRE-PARTY! The Grand Opening Party starts at 6pm and goes until closing (8pm). One ticket is required per child (2-12yrs. Adults and under 2 are free.) See you there!